After having some really warm and sunny spring days, the garden has exploded! Everything looks green again, like we didn’t have had winter at all. 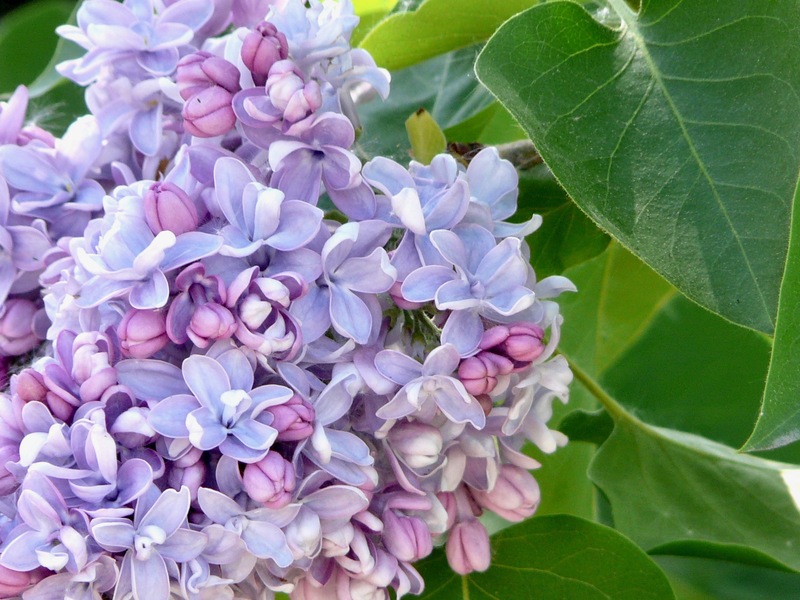 Happily there’s more than only green, flowers start to bloom abundantly in different shades of purple and blue. The flower bed below I have planted in spring last year. It’s wonderful to see the flower plants become bigger and taking in the place I reserved for them. 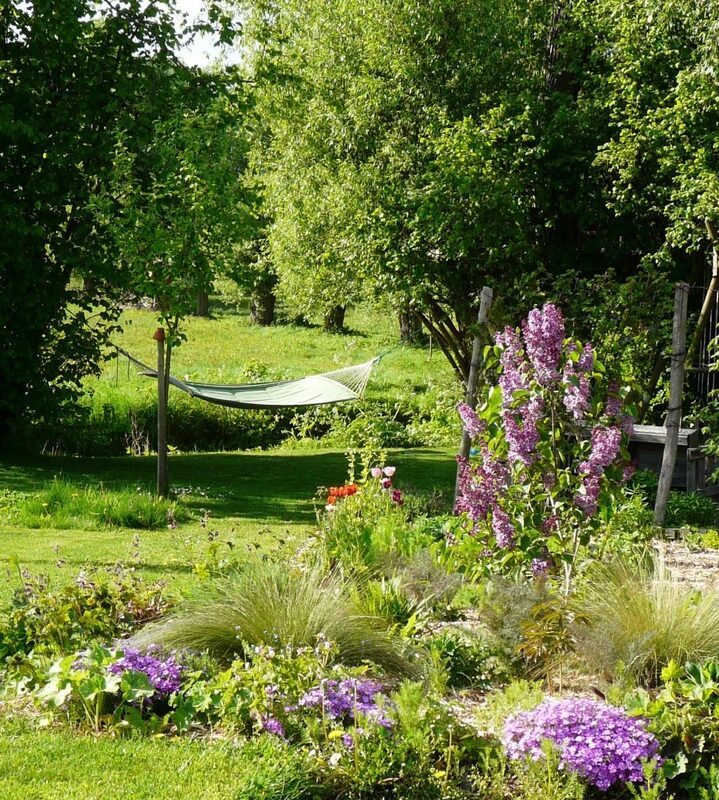 When I made the design for this part of the garden it was difficult to imagine how it would look in reality. But I’m very pleased with the result so far. It’s waiting how it will look in summer…. 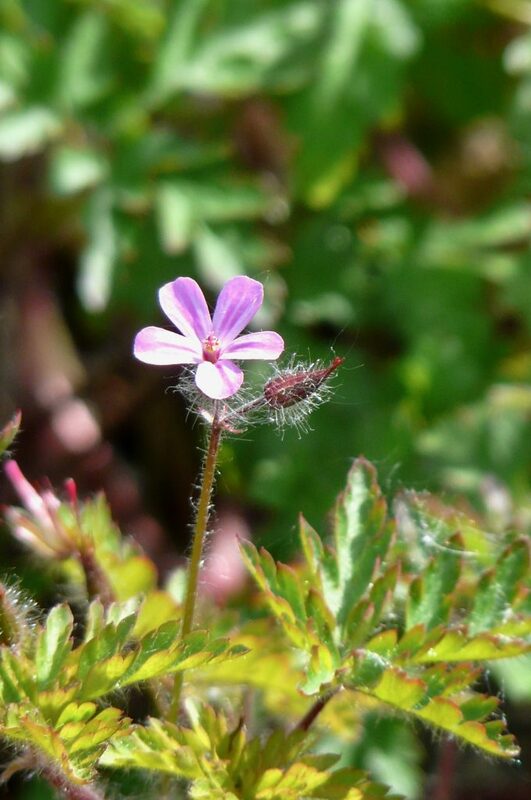 The fragile herb Robert with its feathered leaves. 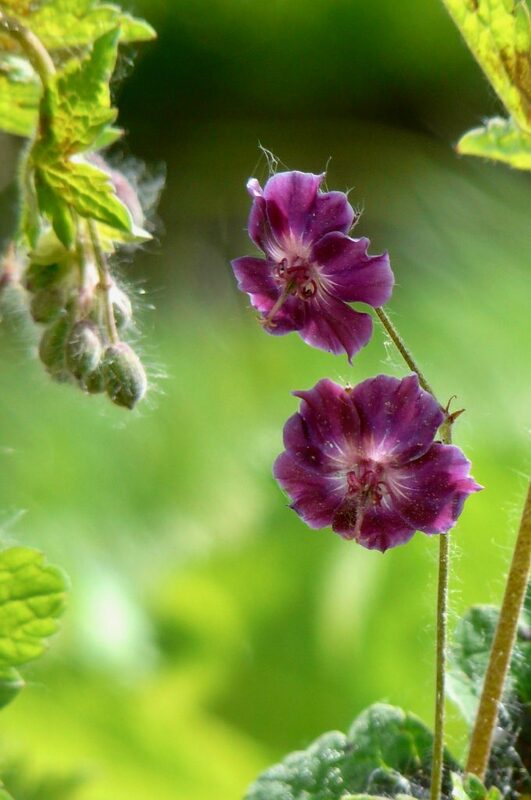 Another flower from the geranium family with lovely purple colored petals. Time for some other colors now! 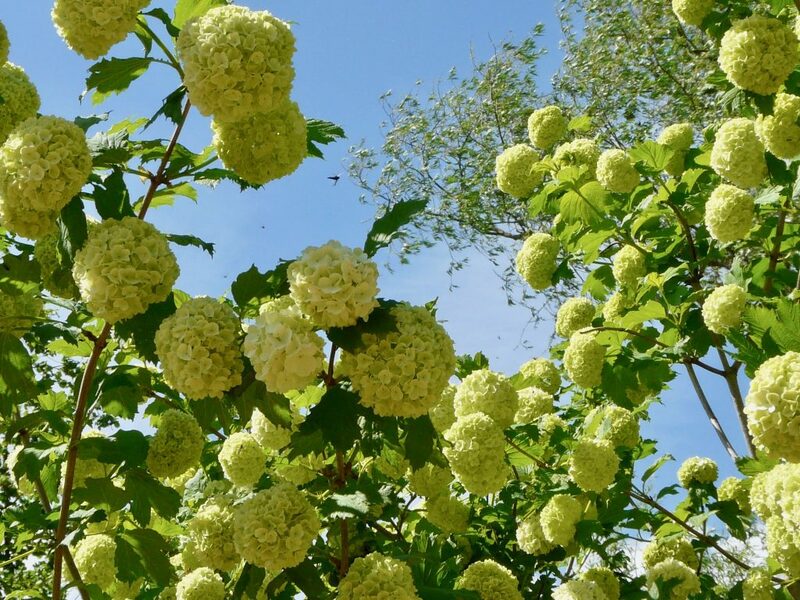 This big bush is called Viburnum opulus and has subtle scented flowers. 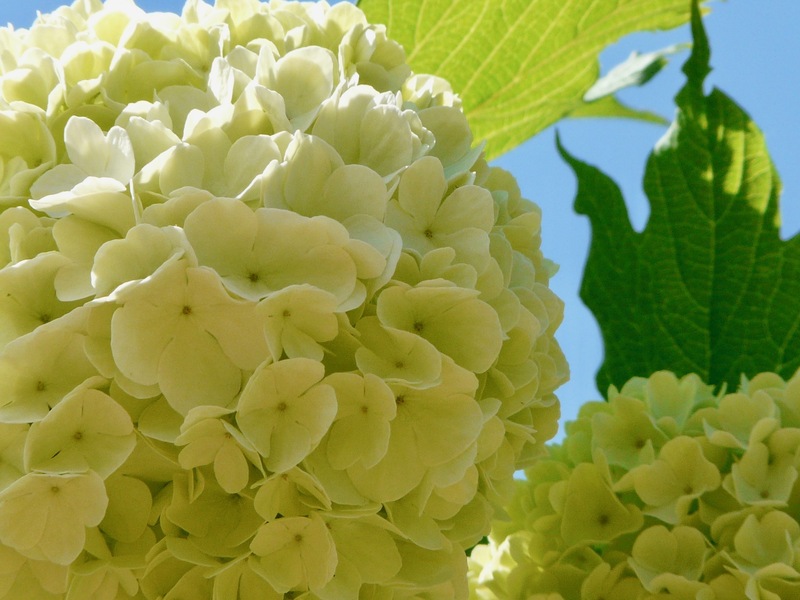 They are also called “snowballs”, little balls of white-green flowers, blooming in spring. As you might have read in my previous blogpost blossoms are all blooming now, also in our garden. 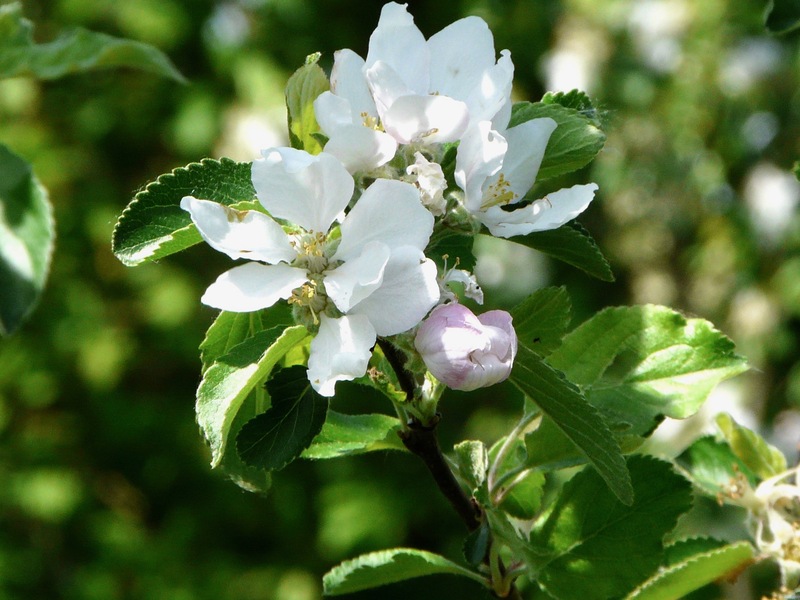 This is one of our apple blossoms. I so much love the subtle pinkish and fine lines in their petals. 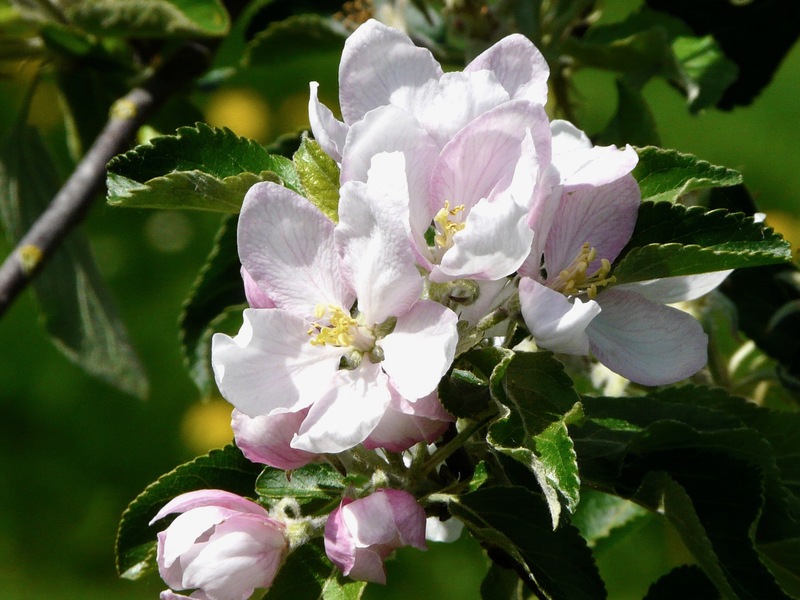 Another apple blossom against a green background. Hopefully we will have a good harvest in autumn. 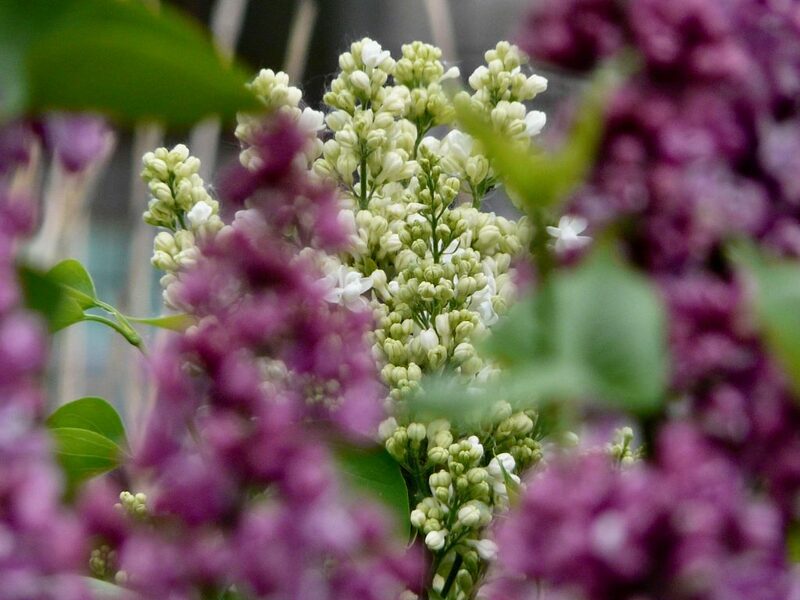 Last year the late frost had destroyed many blossoms. 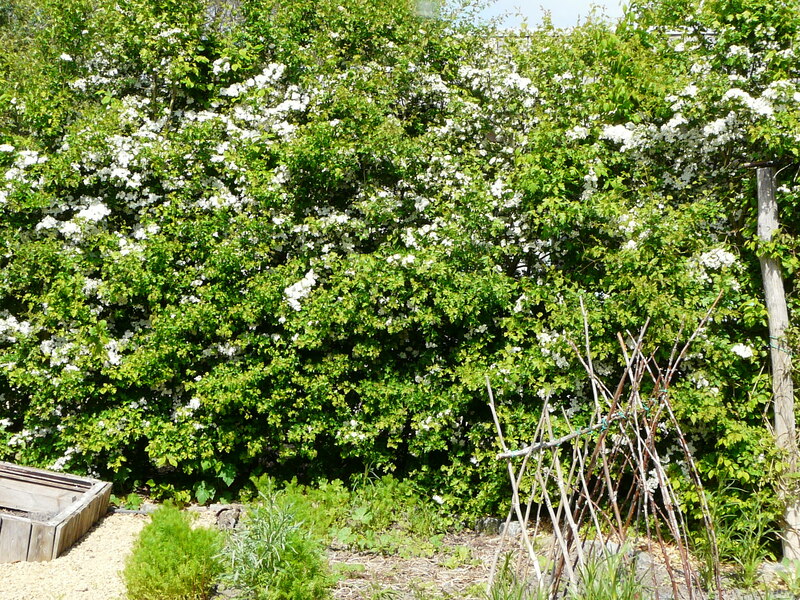 Our hawthorn hedge in full bloom! 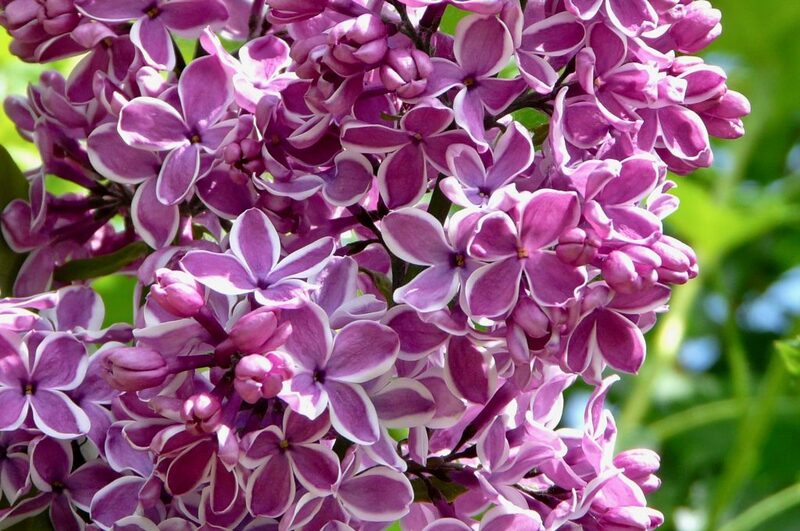 It’s so beautiful and when I pass this hedge I can smell its particular scent. 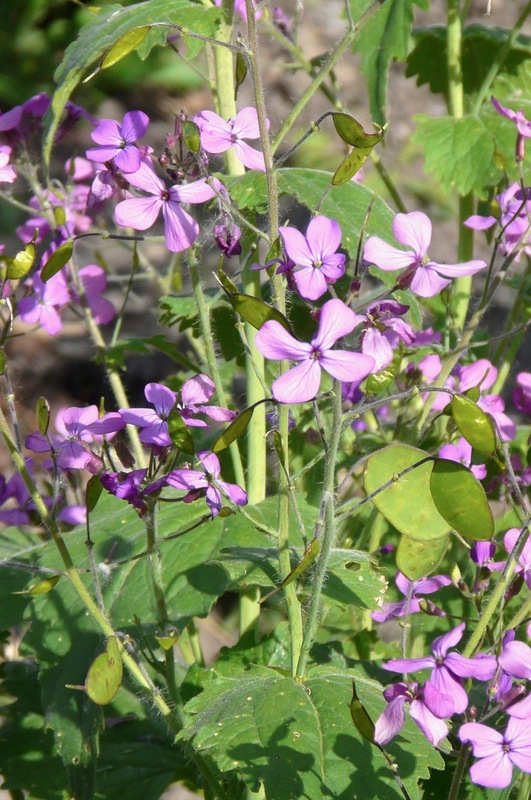 This herb is the ultimate heart tonic. So just put some leaves and flowers in your cup of tea. 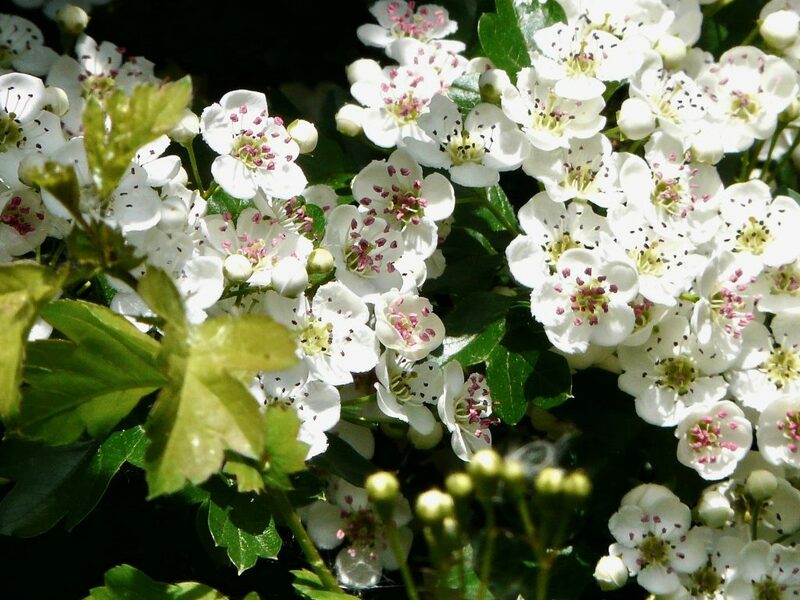 These days when it’s blossoming I always drink at least 1 cup with hawthorn flowers, in combination with lady’s mantle and yarrow. A cup that gladdens a woman’s heart! This lady bug is taking a sun bath, isn’t she lovely?! 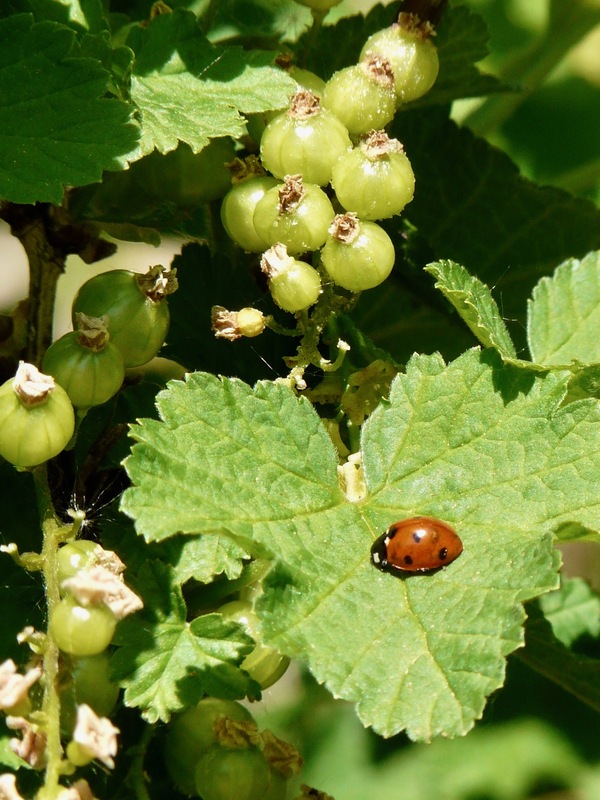 The redcurrant also enjoy the sun as they grow bigger and bigger. I can’t believe how fast they grow, soon they will turn red and be ready to eat. Although it’s mostly my husband (and the birds!) who likes to eat them. I’m not so fond of their sour taste. 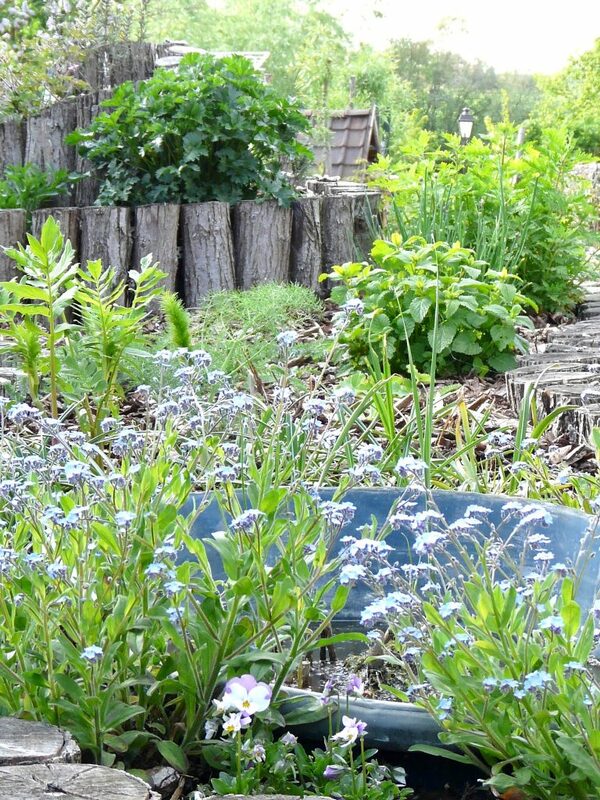 The herbs in our herb spiral are also happily growing. There’s valerian, fennel, lemon balm, pink musk mallow, calendula, rosemary, different kinds of thyme, feverfew, chive, lady’s mantle, yarrow, … Every time I pick some leaves, I have a cup of tea with a different taste. 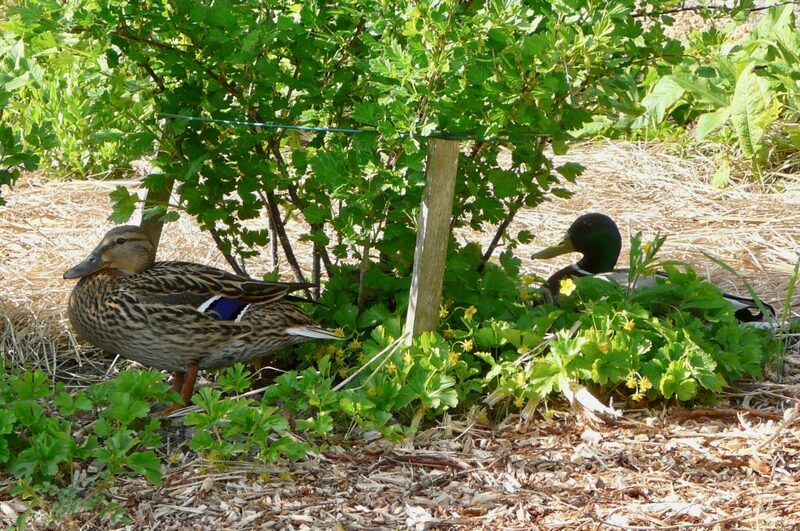 That’s one of the pleasures of the fresh green leaves growing in spring! 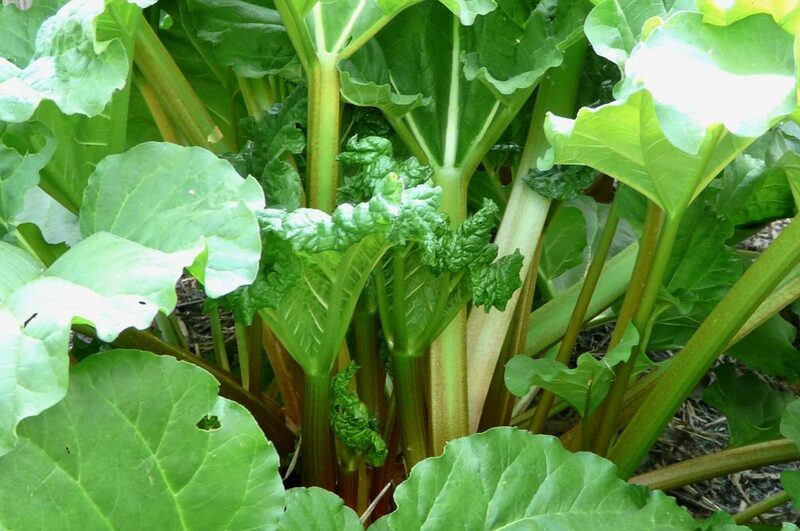 We are blessed with an enormous amount of rhubarb this year. Although I didn’t gave the plants manure, they grow so big. 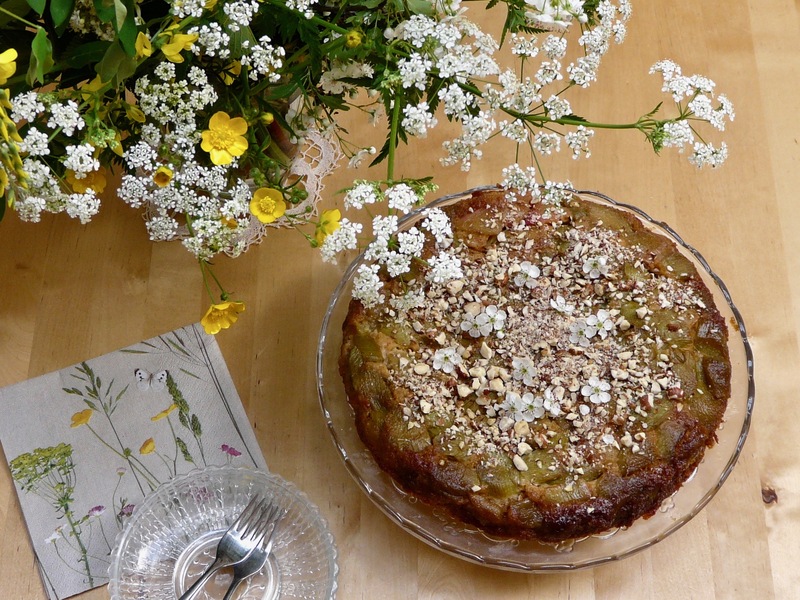 We all really love rhubarb and to celebrate the first harvest of this year I made an upside down rhubarb cake. 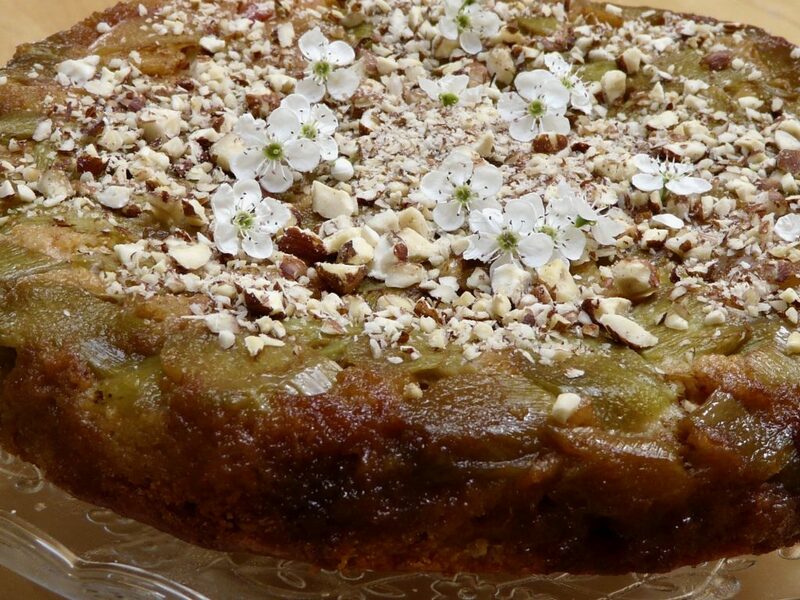 The cake is decorated with a topping of hazelnuts and hawthorn blossoms. 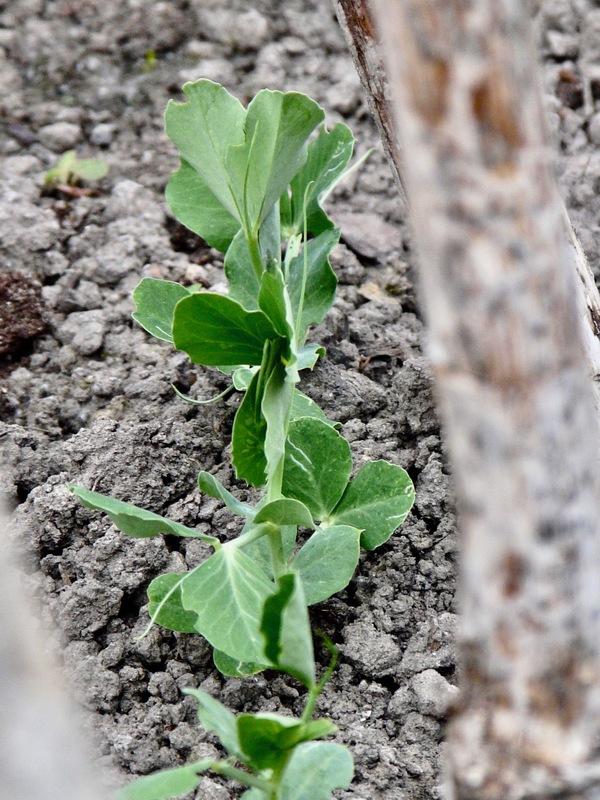 The peas (in combination with radish) I’ve sown are coming out and can start to grow along the fence. It’s so beautiful to see how their tiny green heads are popping out of the dark soil. 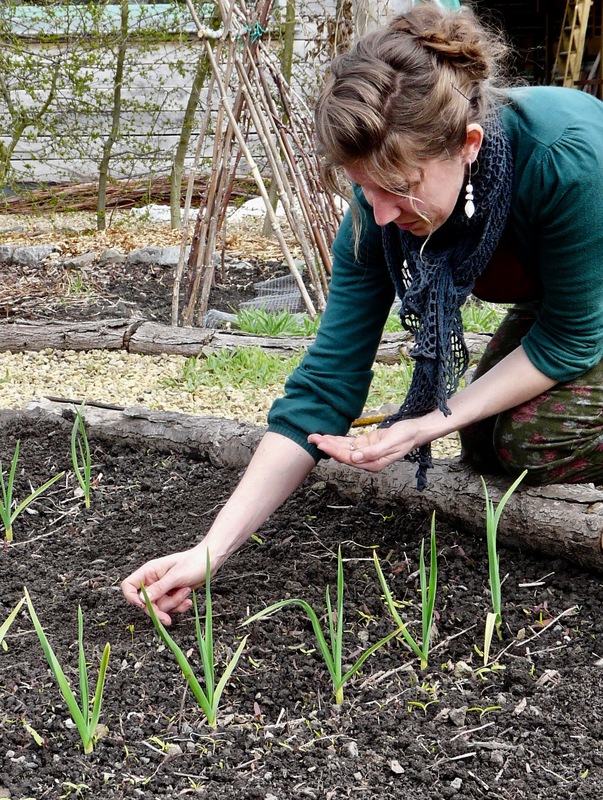 Me, planting tiny onions, in the beginning of March. 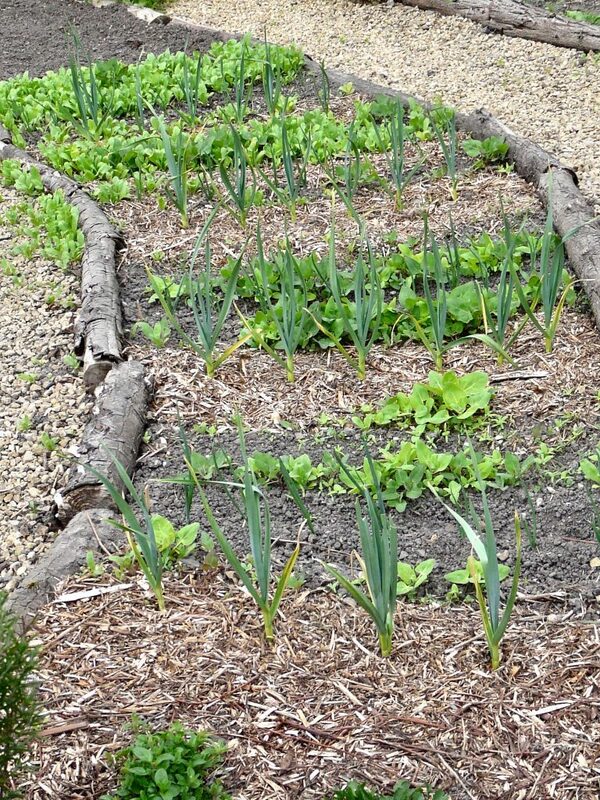 2 months later and this vegetable bed has grown green with garlic, onions, red beet, carrot, calendula and orache. I love to pick some orache leaves and add them to a quiche, salad or into the soup. Just an easy way to have an extra portion of healthy vitamins. 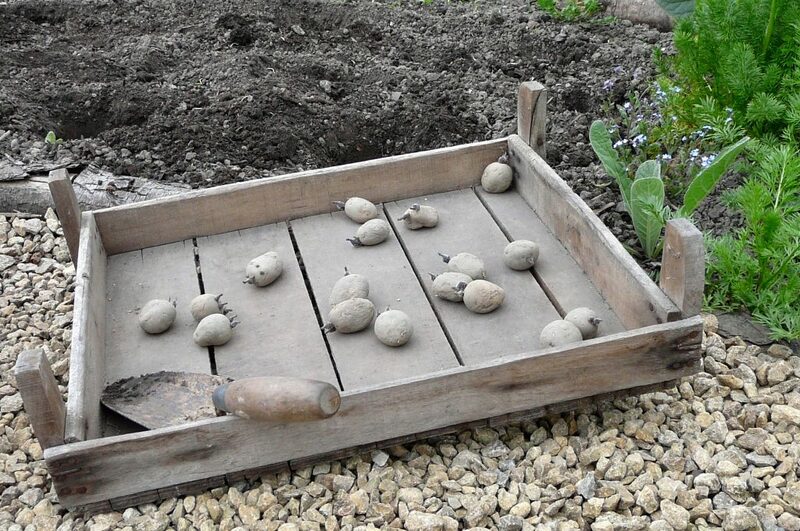 All the potatoes are put into the ground. I have been pre-germinating them and they were ready for a real adventure in the real world/soil! 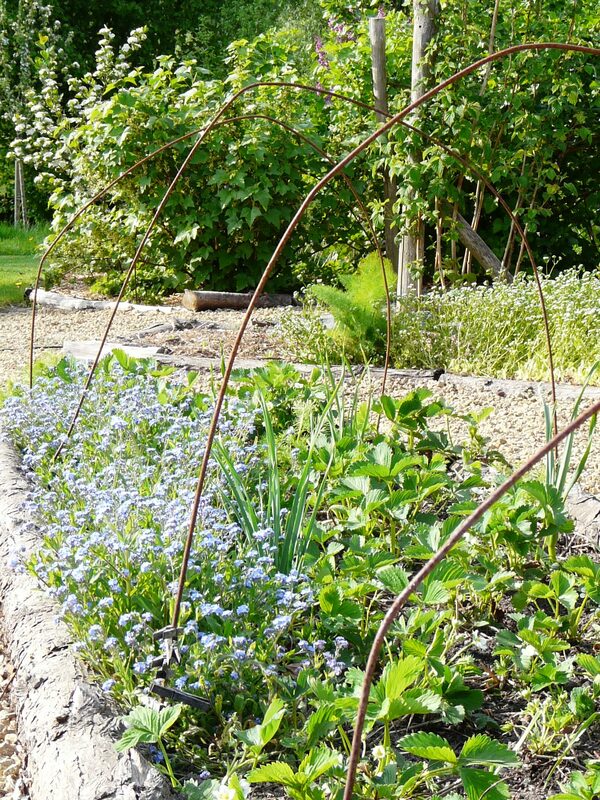 Strawberries combined with forget-me-nots and garlic. 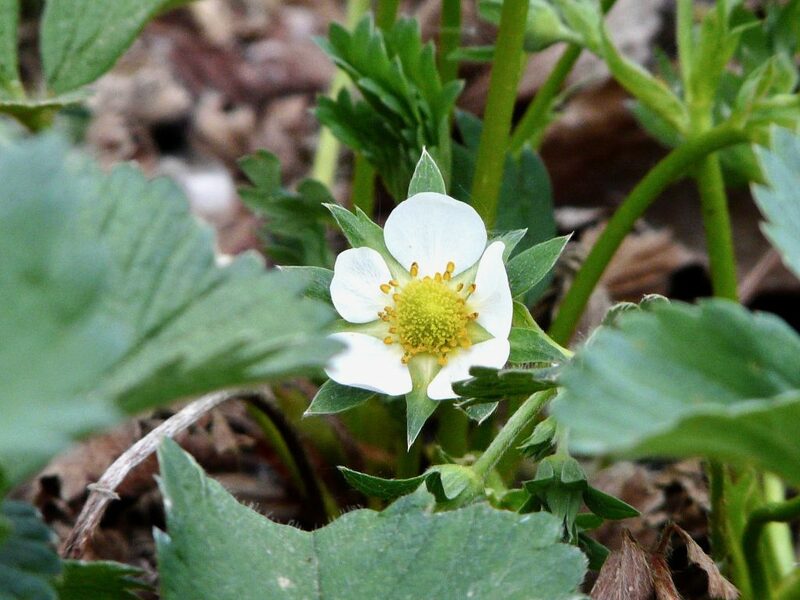 A tiny flower that will soon become a delicious strawberry! Some weeks ago we have this cute couple of wild ducks in our garden. They feel at home and don’t mind we are around. We (and especially the girls) hope they’ll soon have some tiny fluffy ones to take care of. This blogpost has become quite long but I hope you don’t mind I share our life in the garden as it means so much for me and gives me so much joy. 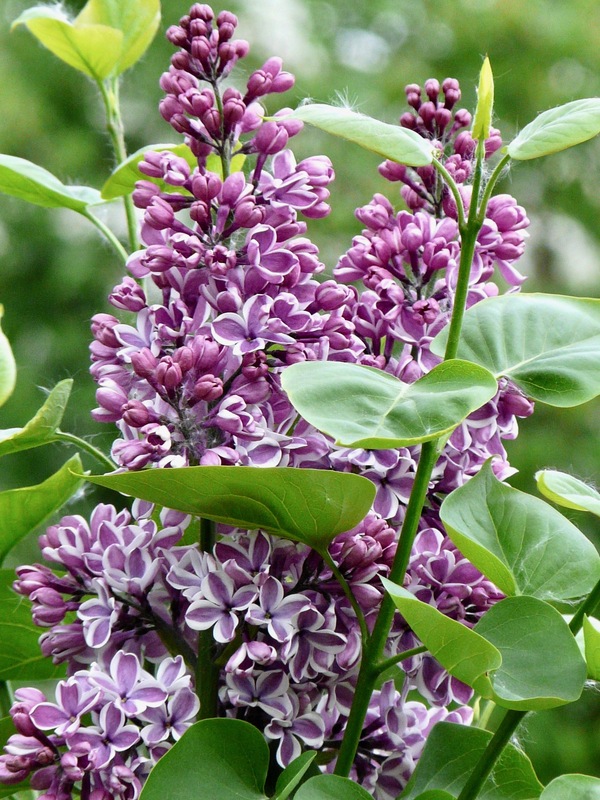 I hope you are all doing well and wish you beautiful spring days!